Mary Washington “Mamie” Langford, daughter of Mary Virginia Knight and William E. Langford, was born August 5, 1883. She married John Shaw on November 18, 1917. The wedding ceremony was performed by primitive baptist pastor Aaron Anderson Knight. Marriage certificate of Mary Washington “Mamie” Langford and John Sheffield Shaw. John S. Shaw was in the Army during World War I. He enlisted at Ft Slocum NY on August 1, 1914. Other Berrien county men who entered the service via Fort Slocum included Rossie O. Knight who enlisted at Fort Slocum, NY on August 31, 1913, and Carter H. Exum and Charlie Turner, both of Nashville, GA who enlisted June 22, 1914. John S. Shaw was detailed to the Bakers and Cooks school at Ft Sam Houston, TX. He attained the rank of Sergeant 1st Class on June 1, 1917, and Quartermaster Sergeant on August 3, 1917. On August 15, 1917 he was detailed to the School for Bakers and Cooks at Camp Jackson, SC. where he became a senior instructor in cooking. He received an honorable discharge on October 19, 1918 to accept a commission. He was appointed 2nd Lieutenant, Quartermasters Corps on October 20, 1918 and was stationed at Camp Sevier, Greenville, SC, apparently taking time off between assignments to come home to Ray City and get married. 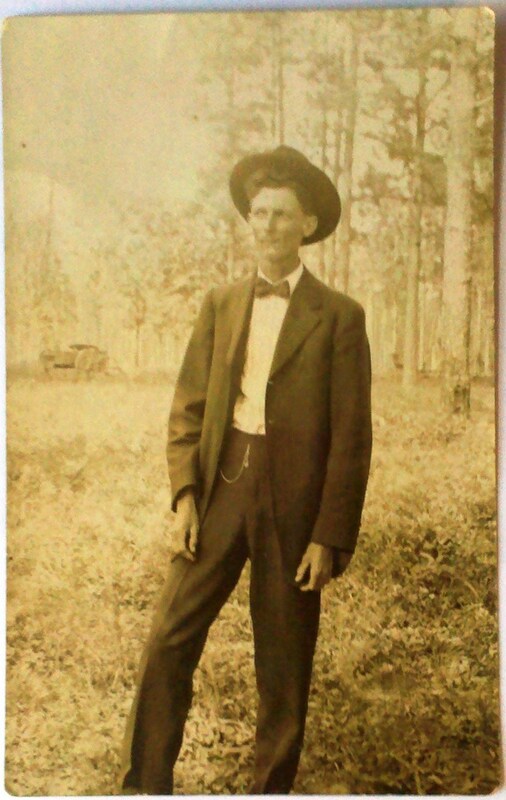 John received an honorable discharge on January 7, 1919 and returned to Ray City, GA where he returned to farming. Mamie and John had a mortgaged farm on the Ray City – Milltown road. John worked the farm on his own account. Their neighbors included Paul Knight, and Mamie’s sister and brother-in-law, Thursday and Albert Studstill. Mamie’s father resided with the Studstills. Grave of John Sheffield Shaw, Beaver Dam Cemetery, Ray City, GA. Image source: Michael Dover. Leland E. Langford grew up in Ray City, GA before joining the Army. 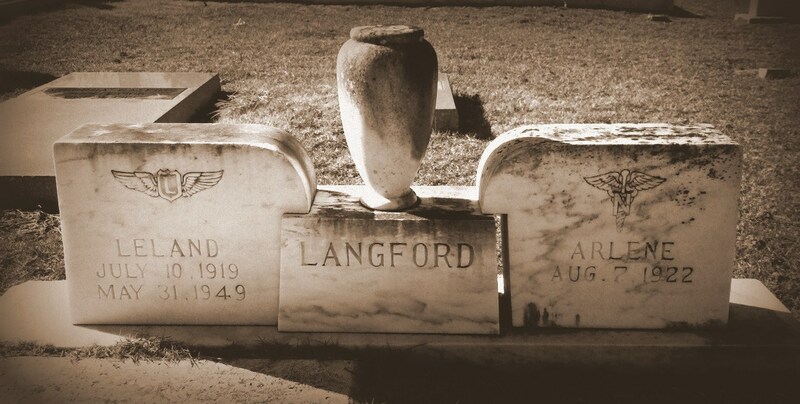 Leland E. Landford was born July 10, 1919 at Ray City, GA, a son of Luther and Amanda Langford. The Langford family farm place was on Rt 2, Ray City, Ga, about 1 mile east of town on the old Milltown (now Lakeland) – Ray City Road. Leland attended the Ray City school where he was a member of 4-H. He graduated with the Ray City High School class of 1939. After graduation, Leland had difficulty finding employment. The Census of 1940 shows he continued to reside in his parents household and that he was doing government work as a carpenter on a school Works Program. For this work he received $8 dollars per week. On June 12, 1941 Leland Langford enlisted as a private in the Army at Fort McPherson, Atlanta, Georgia. Enlistment records show he was 5’11” and 124 pounds. Leland was trained as a pilot and commissioned as a Lieutenant. Some time after he enlisted, Leland met and married a nurse. Lt. Langford continued to serve with the Army after WWII. In 1949, he was working for the Army as a liaison pilot to the Air Force. Army officials and investigators of the Civil Aeronautics Administration yesterday launched a probe of the plane crash which Tuesday night killed two Army liaison pilots and injured an Air force officer near Union City. 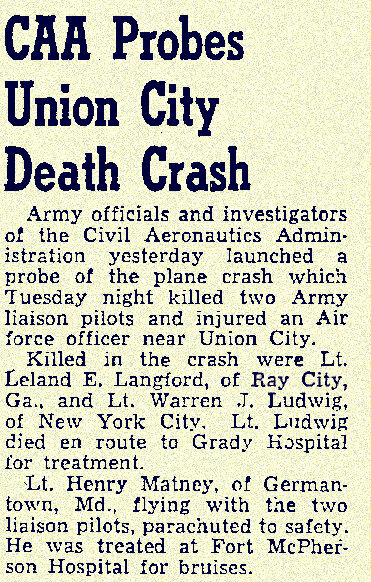 Killed in the crash were Lt. Leland E. Langford, of Ray City, Ga., and Lt. Warren J. Ludwig, of New York City. Lt. Ludwig died en route to Grady Hospital. Lt. Henry Matney, of Germantown, Md., flying with the two liaison pilots, parachuted to safety. He was treated at Fort McPherson Hospital for bruises. Leland E. Langford killed in plane crash, May 31, 1949. Leland’s body was returned to Ray City, GA. He was buried at Beaver Dam Cemetery. Rays Mill news items appearing in the Feb 4, 1911 Valdosta Times were about the business and social scene in the new town. Mr. A.L. Bridges has moved into his new building here. Mr. W. L. Swindle, of Nashville, has accepted a position with his brother, Mr. J.S. Swindle, of this place. Miss Leslie Langford returned to Rays Mill Wednesday night from Vidalia. Mrs. L. J. Clements is spending a few days in Milltown this week. Mr. G. V. Hardee, druggist of this place, moved in his new building Wednesday. Mr. I. Burkhalter made a business trip to Nashville Wednesday. Mr. Floyd Fender, of Tifton, is visiting Mr. and Mrs. W. W. Fender for a few days. Mrs. Baskin, Mrs. Terry, Mrs. Dr. Clements, Miss Fannie Clements and Miss Lessie Carter represented Beaver Dam Missionary Society at the missionary rally in Valdosta last Tuesday, January 31, and lunch was served at the Tabernacle. They report a good meeting, also a pleasant time for all who attended. Mr. A. L. Taylor, of Nashville, has bought Mr. J.T. Webb’s store. Mr. W. M. Carter, of Rays Mill, visited Tifton last Saturday returning Sunday night. Mr. W. H. Terry made a business trip to Valdosta Wednesday. Mr. George Norton spent a few days in Macon last week returning Monday night. Ray City News appeared in The Valdosta Times, Feb 4, 1911. Austin Lawrence Bridges was a merchant from who came to Ray City in 1909 with his bride, Della Pope. He bought a house on Jones Street and opened a dry goods store. William Lawrence Swindle was a farmer of the Ray City area and former Sheriff of Berrien County. He was a brother of James S. Swindle, and son of James Swindle, Pioneer Settler. Leslie Alma Langford was the daughter of William E. Langford and Mary Virginia Knight, and sister of Luther Etheldred Langford. In 1918 she married Walter Greene Altman. At the time he was a clerk working for Nix & Miller Company, a sawmill in Ray City, GA, but shortly thereafter he became an ice dealer. Later Walter owned a cafe where Leslie worked as a waitress. Mrs. L. J. Clements was Eugenia Watkins Clements, wife of Lucius J. Clements. Her parents were Sarah and Thomas H. Watkins, of Whitesburg, Carroll County, GA. She earned a Bachelor of Arts degree from La Grange College in 1907. Gordon Vancie Hardie was a druggist and entrepreneur of Ray City. Isaac Burkhalter, Jr was born 1863 in Clinch County, GA just weeks before his father, Captain Isaac Burkhalter was killed at Gettysburg. Isaac Burkhalter, the son, made his home at Rays Mill some time before 1900 with his wife, Marentha Sirmans, where he engaged in farming until his death. Wilson W. Fender was the owner of the Fender Hotel in Ray City. His wife Lena Fender was in millinery. His eldest son was telephone lineman Floyd Fender, of Tifton, and his younger son’s were Ike and Lutie. Ike Fender was a telephone operator and Lutie Fender was a soda jerk. Mrs. Baskin mentioned in the story could have been one of several Baskin women: Mary Ann Harrell Baskin, second wife of James B. Baskin; her step-daughter, Fannie Ellen Hagan Baskin; or another of the Baskin wives. The Baskin family helped found the Baptist Church at Ray City. Mrs. Terry was Nebbie Luckie Terry. She was a daughter of William F. Luckie and wife of W. H. E. Terry, also mentioned in the article. Mrs. Dr. Clements was Pauline Nelson Clements, wife of Dr. Henry Warren Clements. Dr. Clements owned the second gasoline powered automobile in Berrien County, a Maxwell Doctor’s Roadster. Miss Fannie Lola Clements was a daughter of Martha J. Cements and David C. Clements. Miss Lessie E. Carter was a daughter of Lorenzo D. Carter and Anna Eliza Fender. Jesse Thomas Webb, who sold his store in Rays Mill, was a son of Mary and John L. Webb, of the Connells Mill District. After selling his store in Rays Mill he moved to Tifton, GA and opened a store there. William Manson Carter was a son of Lorenzo D. Carter and Anna Eliza Fender, and brother of Lessie E. Carter. In 1917 he worked as a druggist for C. O. Terry. William Henry Edward Terry came to Ray City about 1910 and built the first brick building in the new town. Luther Elthedred Langford, Ray City, GA native and descendant of General Levi J. Knight. Luther Etheldred Langford was born November 12, 1879 at Rays Mill (now Ray City), GA, the firstborn child of William E. Langford (1854 – 1933) and Mary Virginia Knight (1856 – 1916). His paternal grandmother was Elizabeth Ray, the sister of Thomas M. Ray who co-founded Ray’s Mill. His paternal grandfather, Etheldred Langford, was killed in the Civil War at the Battle of Gettysburg. On his mother’s side, he was a grandson of William Washington Knight, and a great grandson of Levi J. Knight, original settler of Ray City. 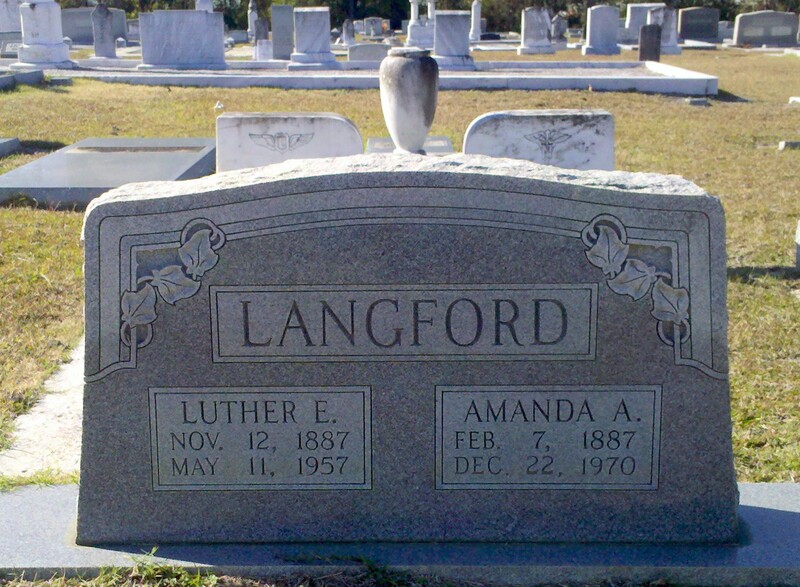 Luther E. Langford married Amanda Asbell October 23, 1910 in Colquitt County, GA. She was born February 7, 1887. Luther Etheldred Langford and Amanda Asbell “Mandy” Langford, of Ray City, GA. Image courtesy of Johnnie Mobley. Luther and Amanda Langford made their home in Berrien County, Georgia. On Sept 12, 1918 Luther reported to the Berrien county draft registration board, where his WWI draft card was completed by registrar D.A. Sapp. Luther’s occupation at the time he registered was farming, self-employed. At 39 years of age, he was tall and slender with gray eyes and light hair. His farm place on Rt 2, Ray City, Ga, was located about 1 mile east of town on the old Milltown (now Lakeland) – Ray City Road. 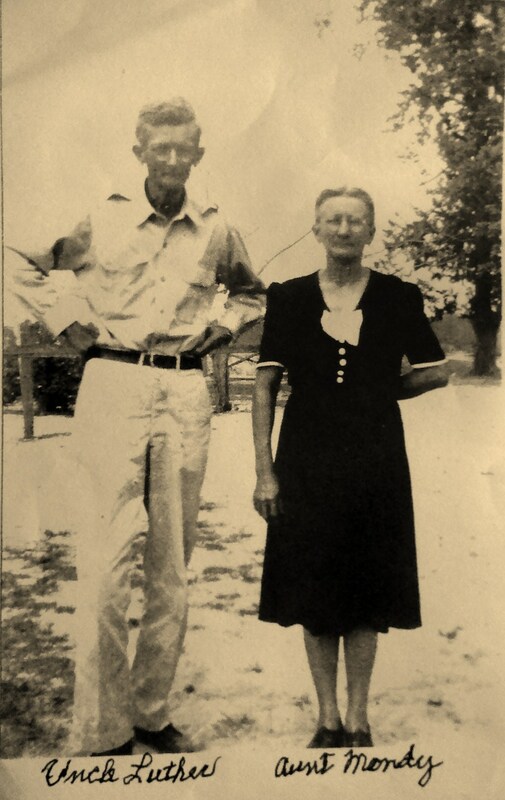 Luther and Amanda spent their lives in Berrien County raising crops and children. Edwin Vasco Langford, born August 2, 1917 ; died 2005 – Served in WWII; taught at Ray City School after the War. Gravemarker of Luther Etheldred Langford and Amanda Asbell Langford, Beaver Dam Cemetery, Ray City, GA.